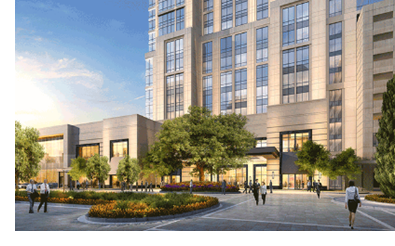 ​​​​​​ HOUSTON – Post Oak, a 700,000-sf mixed-use tower at Uptown Houston, is slated to arrive March 2018. It will include a 250-room luxury hotel, boutique office space, and 20 residential apartments. Additional amenities will include a two-story spa and salon, signature restaurants, and retail. A structure adjacent to the tower will house 35,000 sf of multifunctional space, complete with two ballrooms at 16,000 sf and 3,000 sf, and 10,000 sf of conference space. More than $1 million will be spent to transplant and install large specimen oak trees to the development.